The fortune of Cortina d'Ampezzo begins after the winter Olympics of 1956, with the construction of residential areas and a whole district of plants for winter sports. Today in Cortina are available three ski areas: Cortina Cube (Cristallo, Faloria, Mietres,) Tofana and Lagazuoi-5 Torri, for a total of over 115 kilometers of pistes, served by 40 lifts between ski lifts, cable cars and chair lifts. The ski resort of Cortina d'Ampezzo is one of the most complete and ranges from downhill skiing to freeride: for your holiday in the snow with children, Cortina provides dedicated and protected facilities, where it's possible to ski safely. But the city is also glamour and shopping: along the streets of the centre of Cortina d'Ampezzo, you will find boutiques and exclusive restaurants often frequented by Vips and celebrities. Hotels in Cortina d'Ampezzo are among the most prestigious of the whole alpine arc: the 4 star hotels in Cortina are always very elegant and refined, with great services and restaurants. Accommodation in Cortina with wellness center and spa are very requested by anyone who loves après-ski relax. The Columbia Hotel blends the mountain charme with the elegance of a modern hotel. 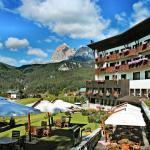 It is located close to the ski slopes, in the heart of Cortina D'Ampezzo. 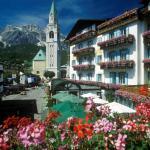 The Hotel Europa is strategically situated in the elegant heart of Cortina d'Ampezzo. 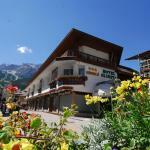 The property, a charming mountain-style building, is located just a few steps from the ski slopes. The Mirage Hotel is located just outside the town centre of Cortina d'Ampezzo, offering great views of the surrounding mountains. It offers a transfer service to the town centre and the ski slopes. 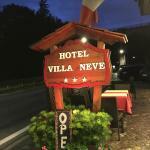 A short distance from the heart of Cortina d'Ampezzo, the cozy and elegant Hotel Lajadira welcomes you. The hotel is well connected to the city centre and the lifts, with the buses that run regularly. Hotel Olympia was built for the 1956 Olympics and is in a fabulous location in the Alpine resort of Largo Poste, a short distance from the famous Cortina d'Ampezzo with panoramic views over the Tofane.